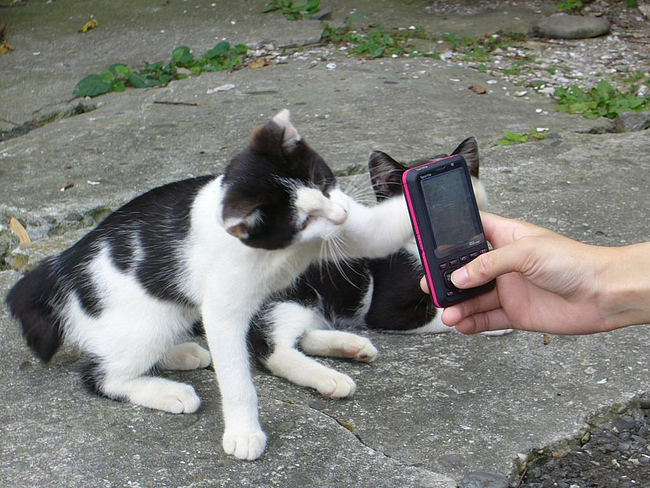 The internet loves cats. And the only thing it loves more than cats is an island full of cats. 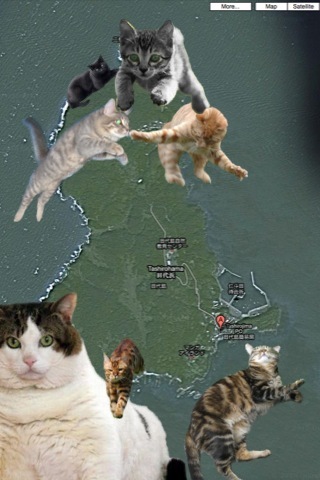 Needless to say, Japan's Cat Island is an obsession online. 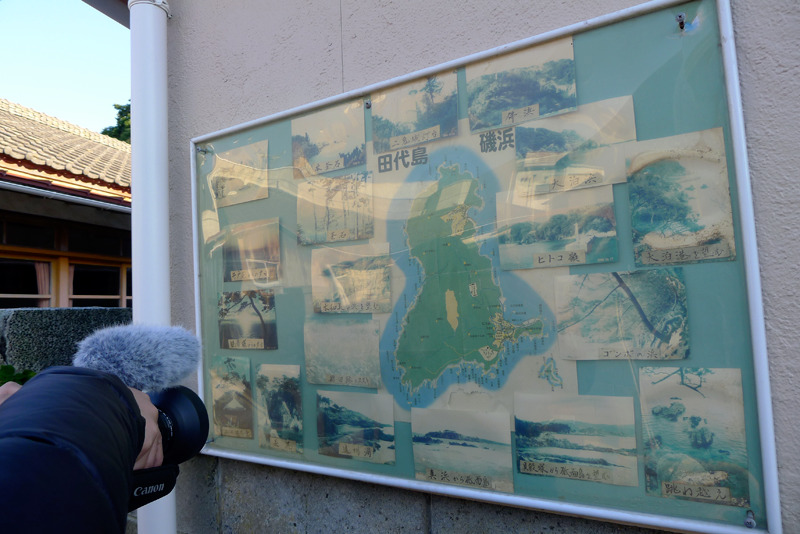 Even though it's been covered with cats for decades, every 6 months a news outlet introduces cat island as if it's brand new. 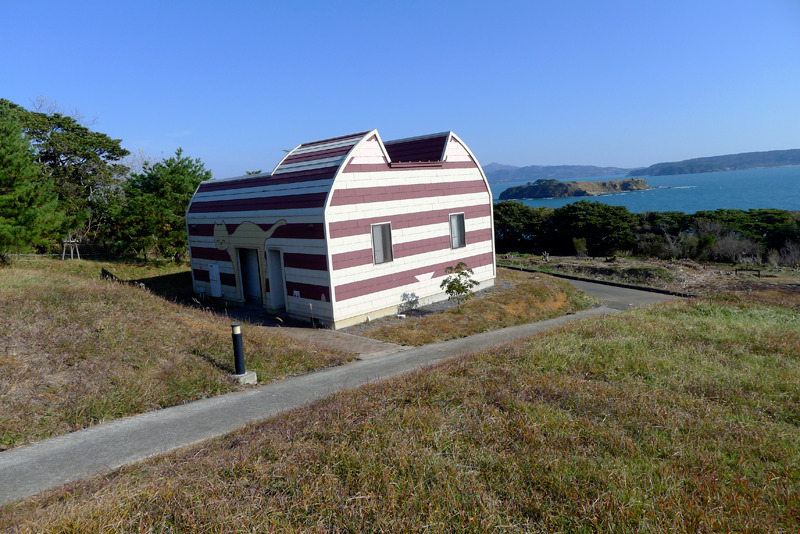 But the truth is, Tofugu went to Cat Island before it was a thing. Before it was cool. We're internet hipsters like that. 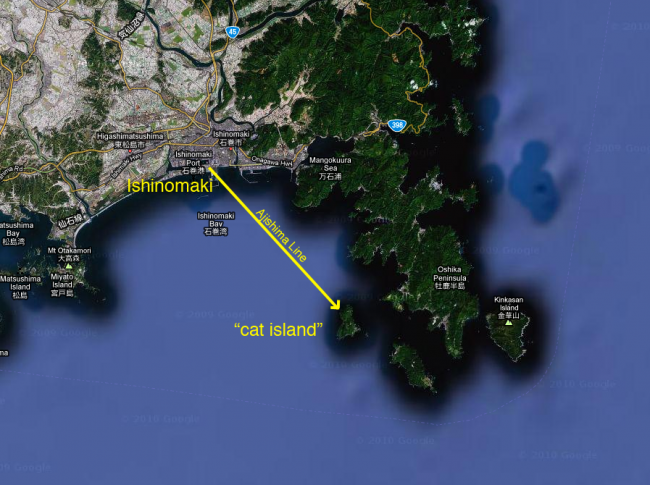 So let us re-re-re-re-re-re-introduce you to Cat Island, and show you what it was like back before Tashirojima sold out and got famous. 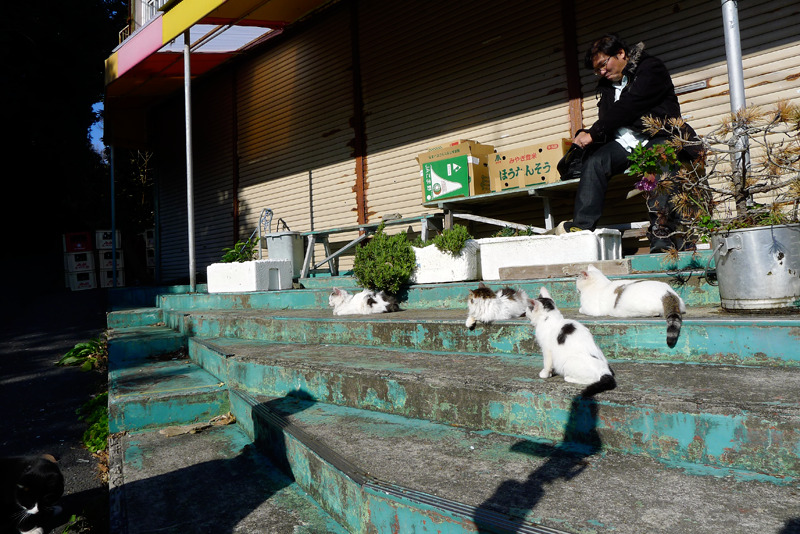 "Cat Island," officially known as "Tashiro Island" (田代島), is an island near Ishinomaki City in Miyagi Prefecture… and yes, to answer your one burning question… it's covered in cats. Check out this Google Maps satellite view of the island. In all seriousness, though, it can be accessed via ferry. 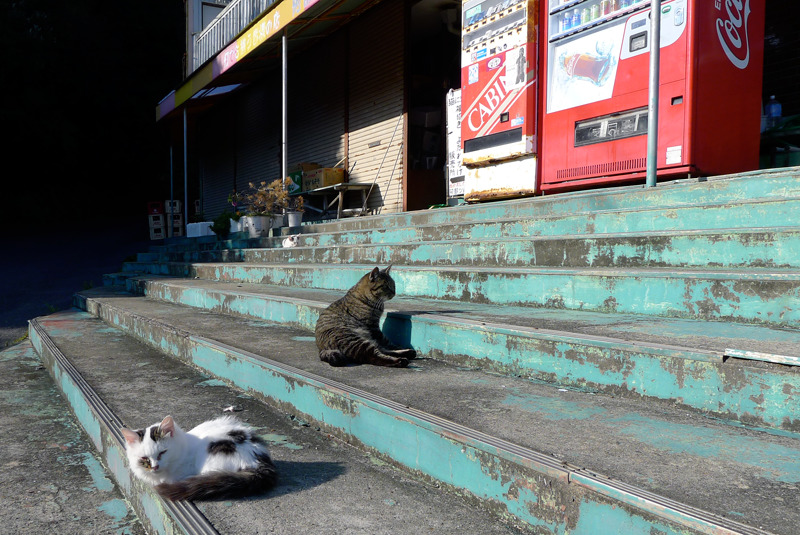 You can get from Ishinomaki 石巻（） to Tashirojima (Cat Island). 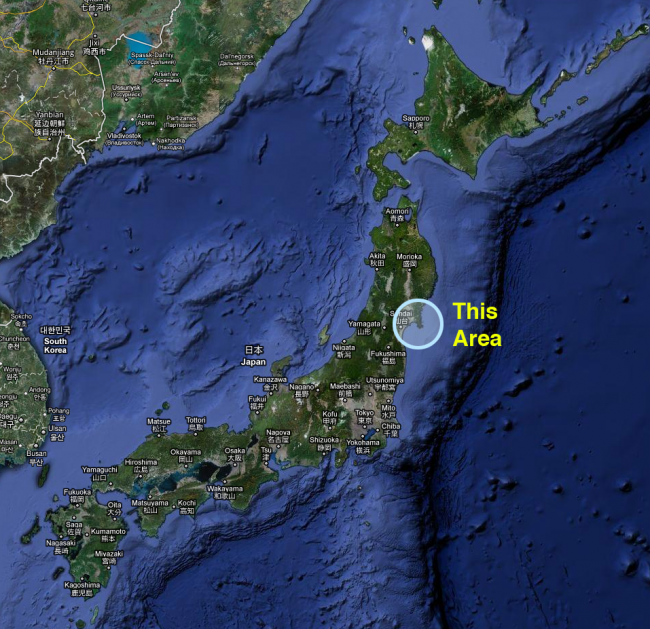 Here's a big picture of Japan to see what area it's in. 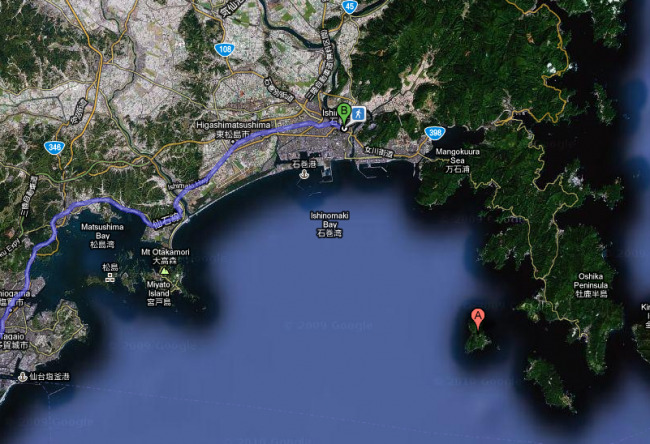 And if we zoom in, we can see Ishinomaki and Tashirojima and how close they are to each other. 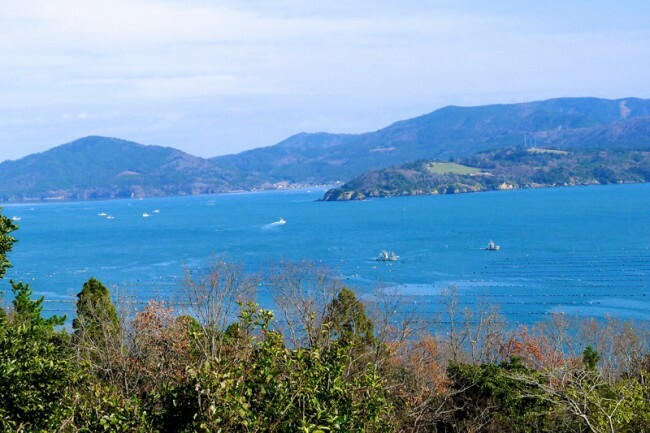 (and all of this is east of Sendai, Japan). 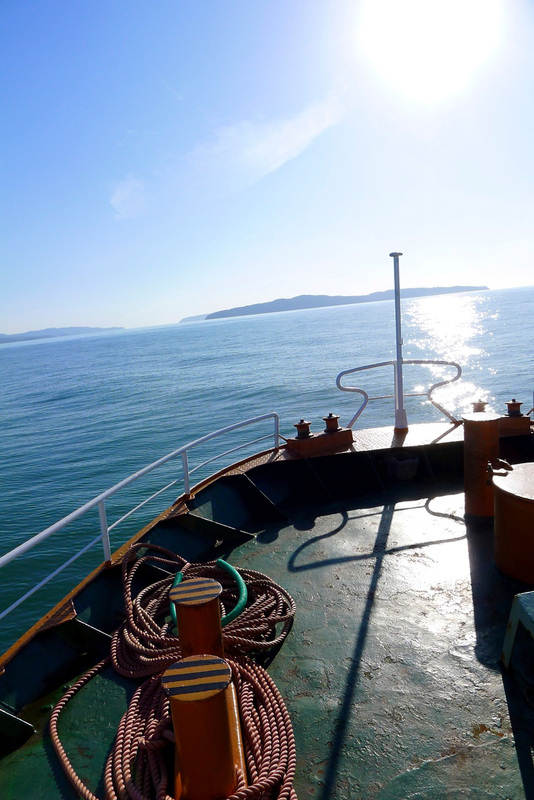 When you go, you take an awesome little ferry, too. Sadly, not cat shaped in any way. 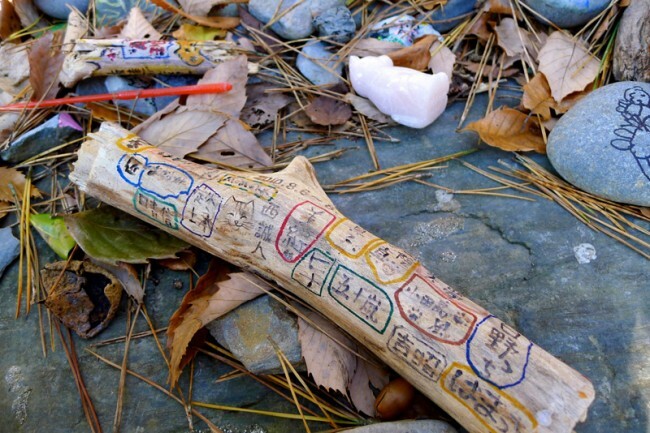 Most of the population is pretty old, with an average age between 60 and 70 (that’s old!). 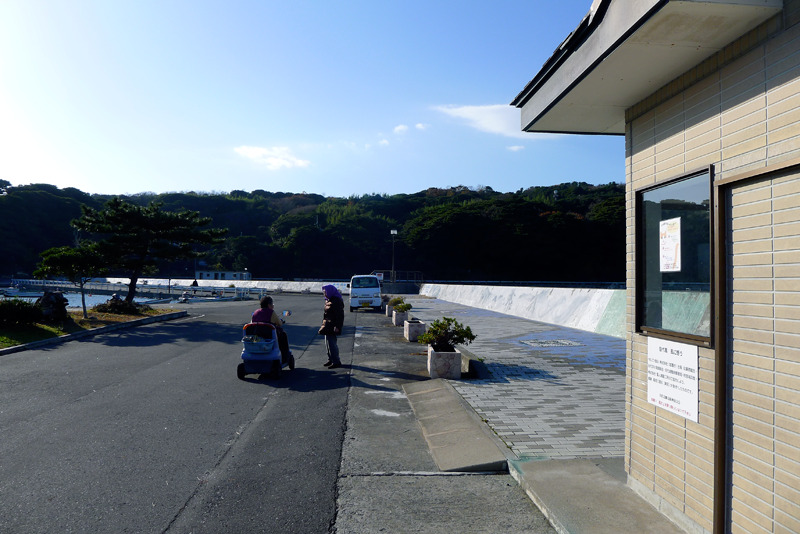 Their main industries include fishing and people visiting to come look at the cats. 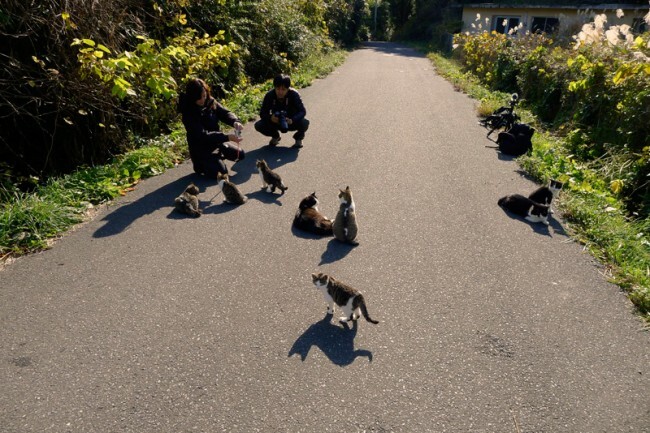 A while back, fishermen started feeding the cats thinking it was good luck. 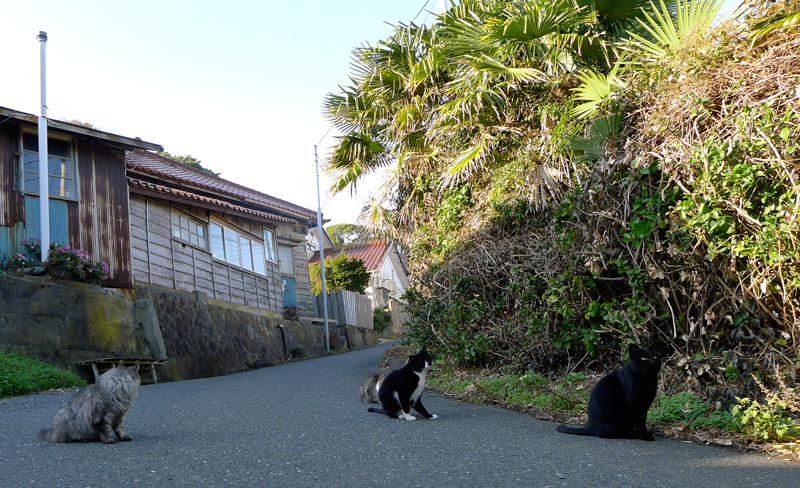 After a while, people started noticing the amount of cats on the island, and it became a little tourist attraction. 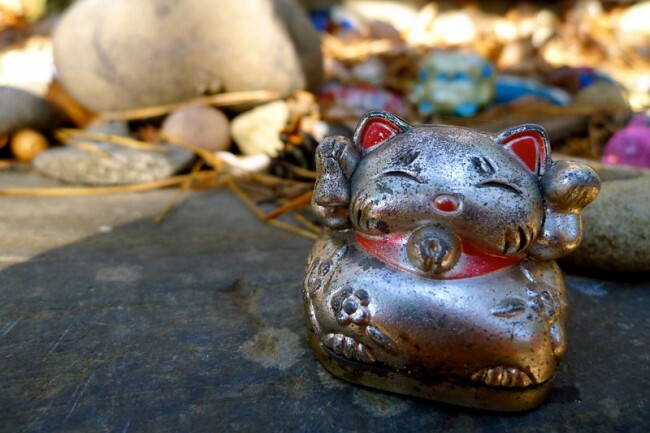 In the past, the islanders raised silkworms for silk, and cats were kept in order to keep the mouse population down (because mice are a natural predator of silkworms). 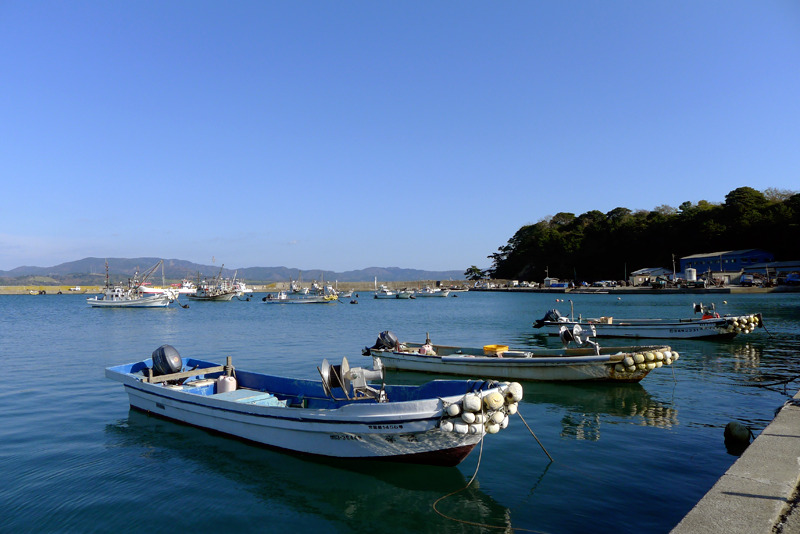 Fixed-net fishing was popular on the island after the Edo Period and fishermen from other areas would come and stay on the island overnight. 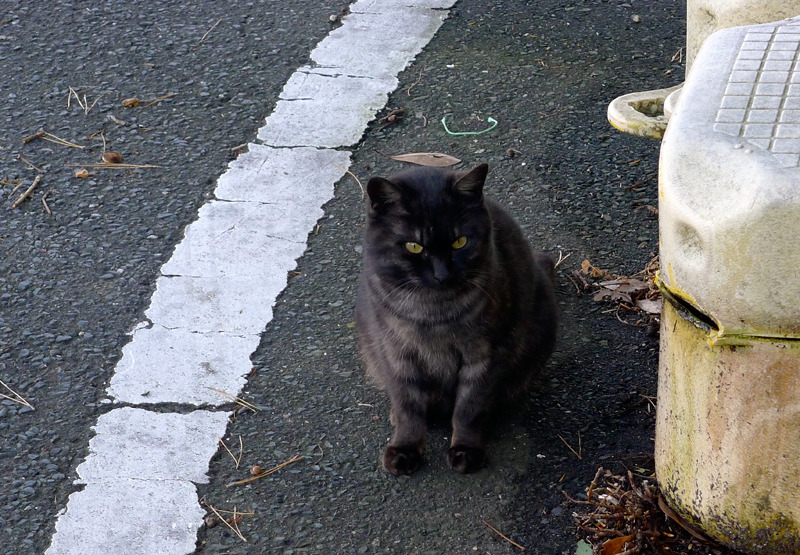 The cats would go to the inns where the fishermen were staying and beg for scraps. 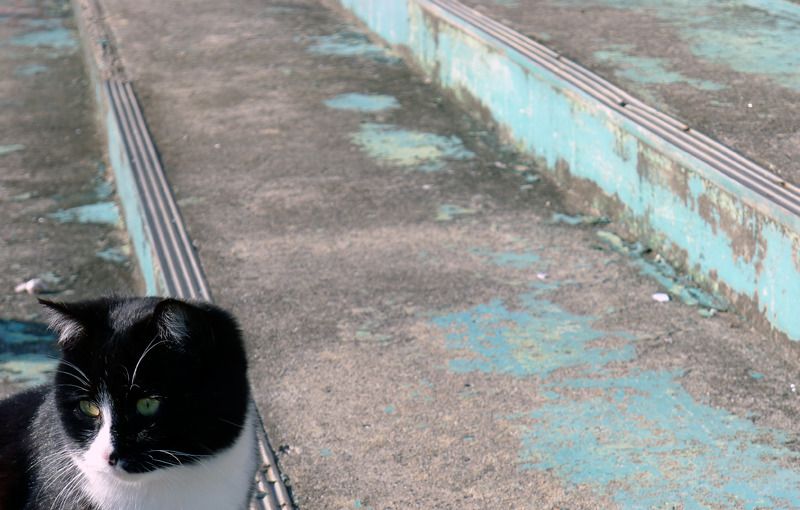 Over time, the fishermen developed a fondness for the cats and would observe the cats closely, interpreting their actions as predictions of the weather and fish patterns. One day, when the fishermen were collecting rocks to use with the fixed-nets, a stray rock fell and killed one of the cats. 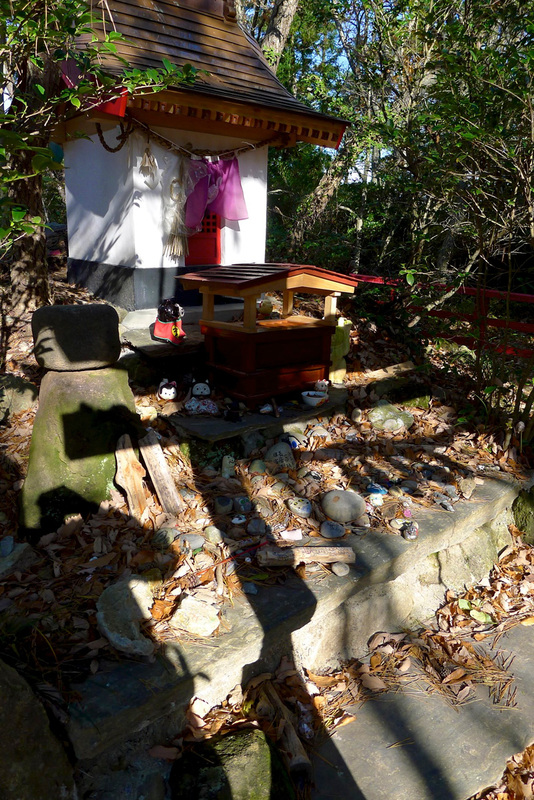 The fishermen, feeling sorry for the loss of the cat, buried it and enshrined it at this location on the island. 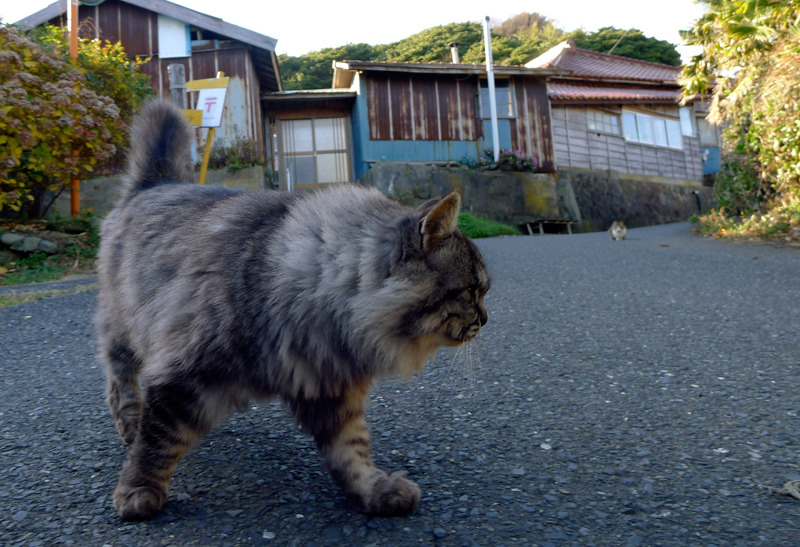 The modern people of this island are hoping that they can use the cats (coupled with a decent amount of media attention they've been getting) to attract people to visit, then eventually live there. If they don't, then I'm afraid the island will look like a scene from Jurassic Park 2: Lost World, minus the dinosaurs with a few thousand cats thrown in. 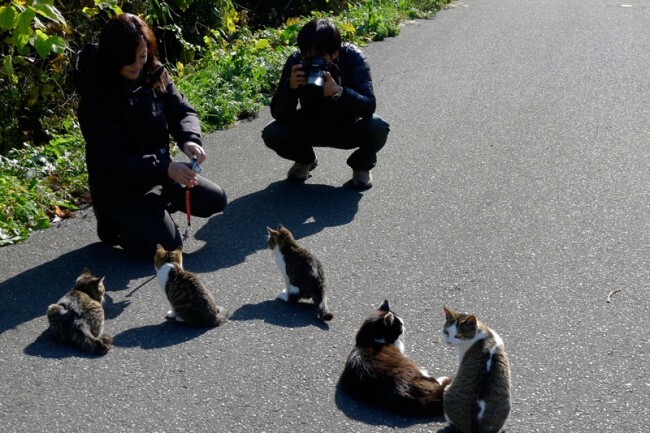 It's only been a couple years, but I guess it's kind of working – a lot more tourists make their way to Cat Island to take pictures of cats, feed cats, pet cats, and all kinds of other things you can do with cats. Basically, if you like cats, this is going to be your little Cat Mecca. 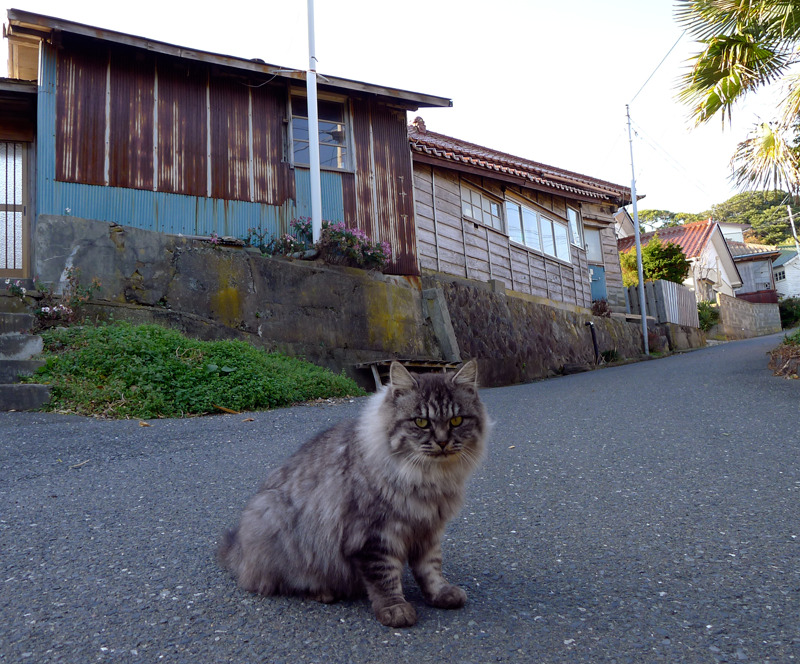 There are two villages on the island (Oodomari and Nitoda), with Nitoda containing most of the cats. 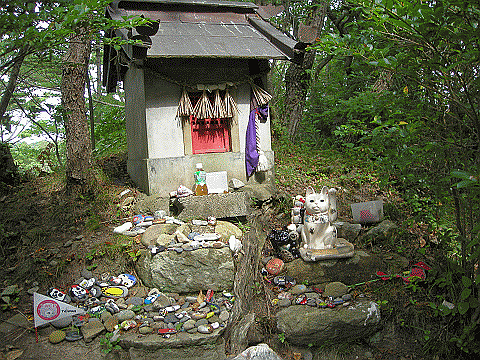 Near the centerish of the island (though closer to Nitoda) is the “Cat Shrine” (猫神社). 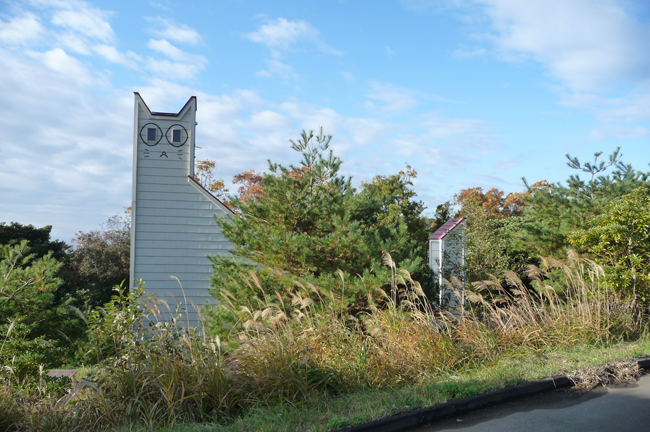 There are cat shaped buildings (also near Nitoda), as well as various other (smaller) attractions. 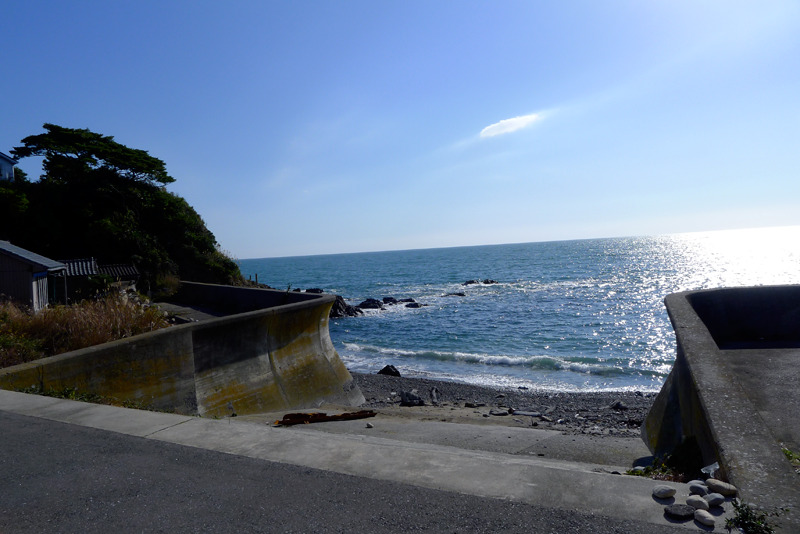 Although you can walk from Oodomari to Nitoda, most of the “fun stuff” is on the Nitoda side, so try to stop on that side if you’re going. Thing is, you can walk this island in a day if you wanted. It's only about 8 square miles. Don't go into any dark alleyways, though, you never know what a mob of cats might do to you. Oh, and of course, dogs are strictly prohibited. 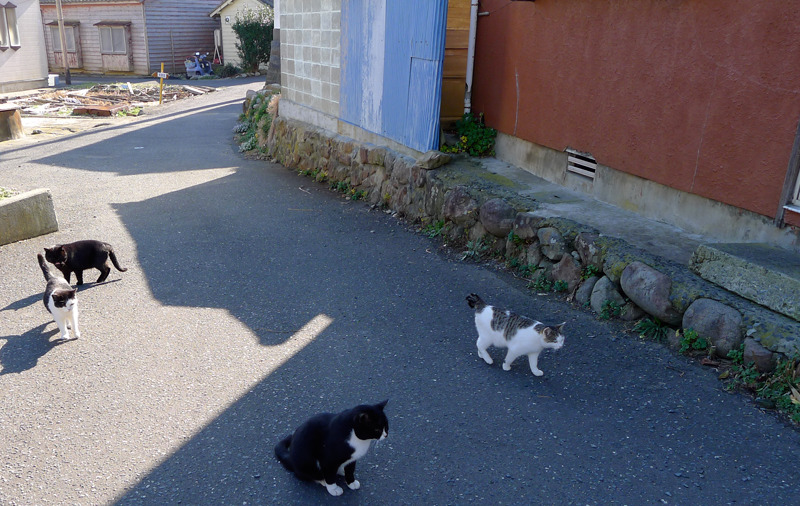 Cat Island Japan. It’s an island covered in hundreds, maybe thousands of cats. People population? Under 100. 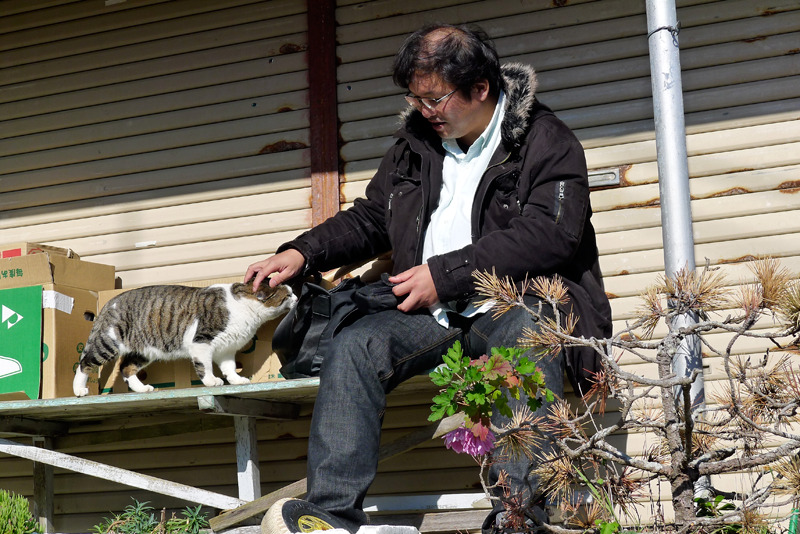 This island has become a little tourist attraction for people who happen to like cats. 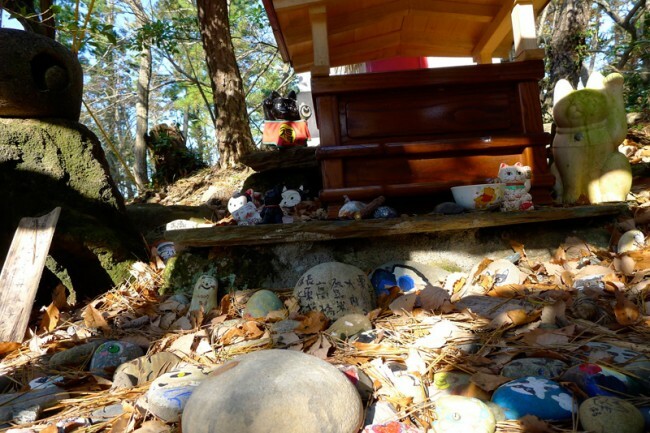 You can take pictures of them, pet (some of) them, stay in cat-shaped lodging, and even visit a cat shrine. I’d recommend watching the video (above) before reading this if you don’t want “spoilers” (I put quotes because there probably isn’t too much to spoil in the way of plot twists, etc… this is a travel show, after all). In this episode, I’m joined by Shinnosuke (follow on Twitter), a friend from college who’s from the Saitama region of Japan. 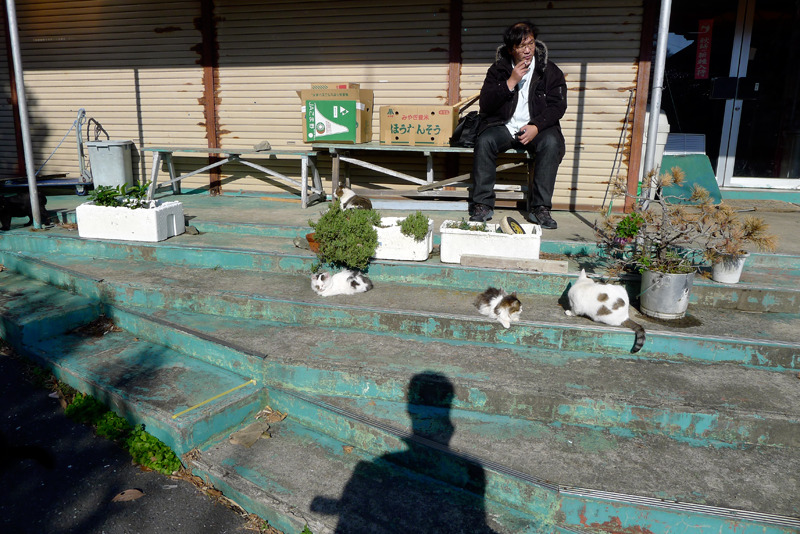 We traveled to a few different places, one of which was “Cat Island” (aka Tashirojima). 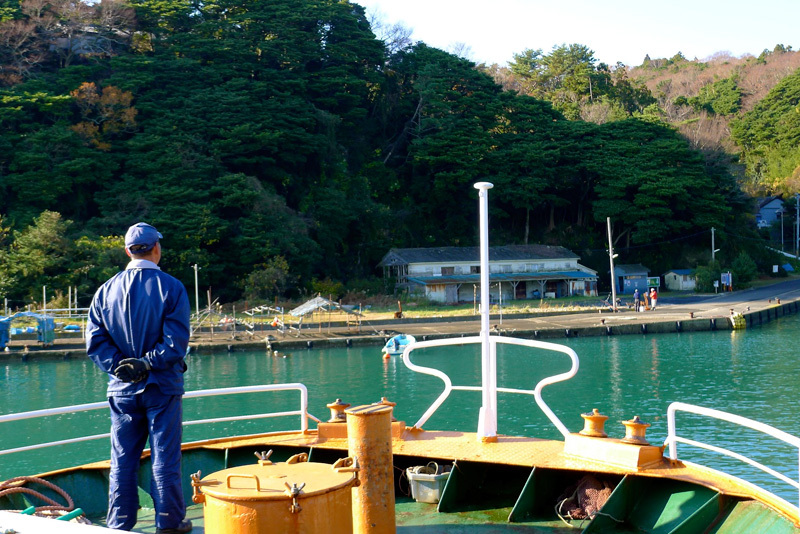 Traveling from Sendai to Ishinomaki by train, then from Ishinomaki to Tashirojima by ferry, we arrived in the early afternoon, searching for cats. 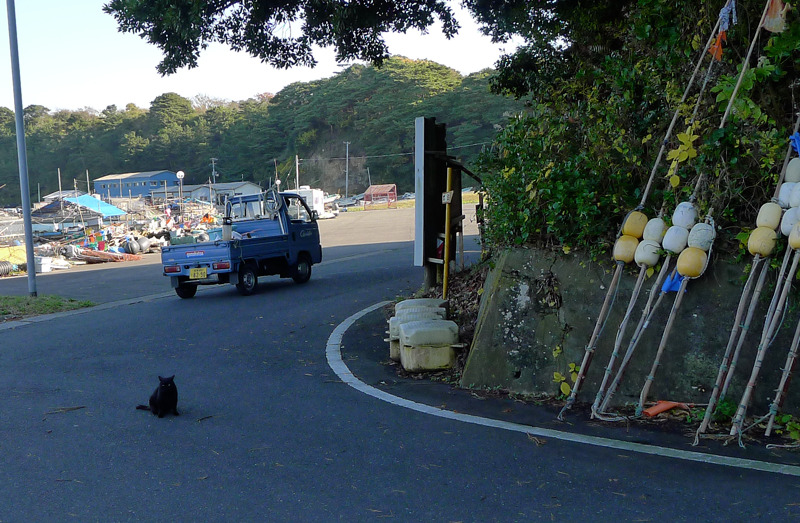 Unfortunately, finding cats was difficult for a while, since we got off on the side of the island that didn’t have cats. 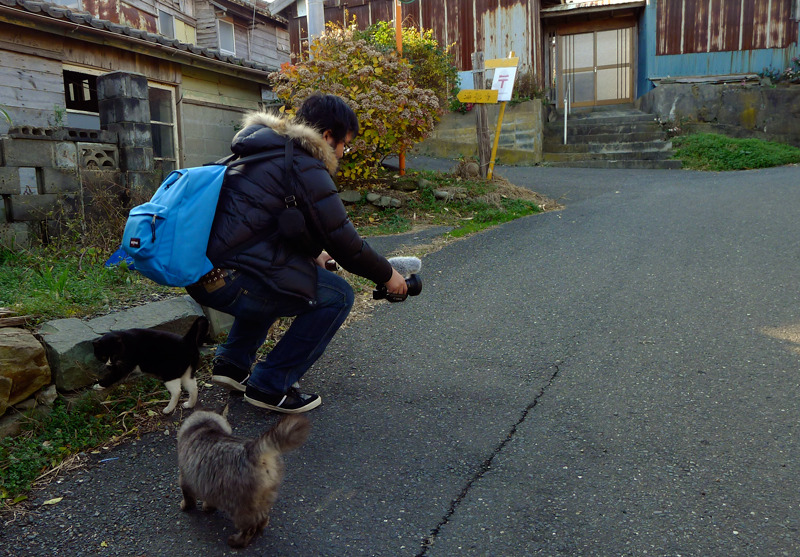 This episode is all about getting to Tashirojima, as well as our search for the cats of “Cat Island.” Will we find cats? You’ll have to watch to find out. 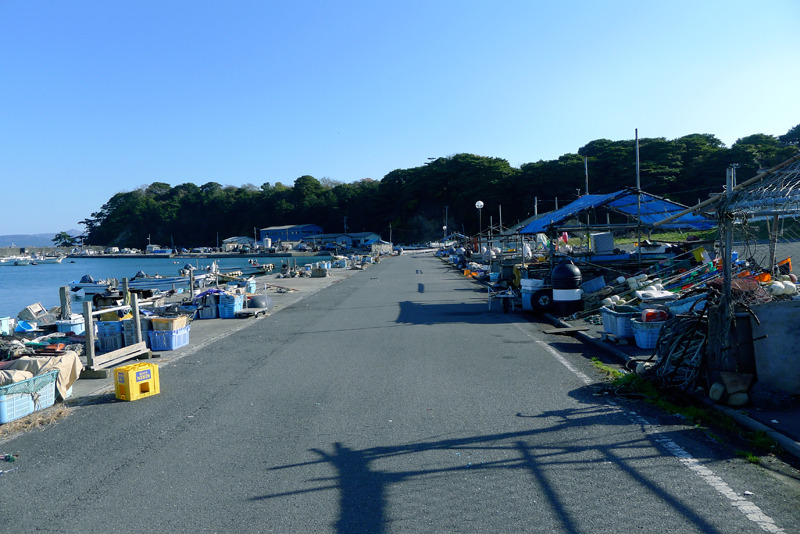 Currently, getting to Tashirojima is probably a bit of a challenge because of the earthquake damage. If you’re coming from the south (good chance you are), you’ll want to get to the city of Sendai. 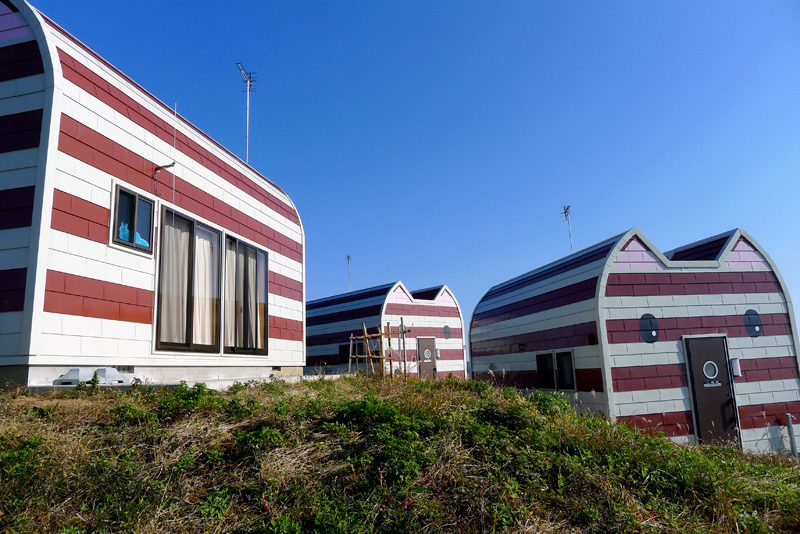 From Sendai, you can take a local train to Ishinomaki (which was pretty heavily damaged in the quake). 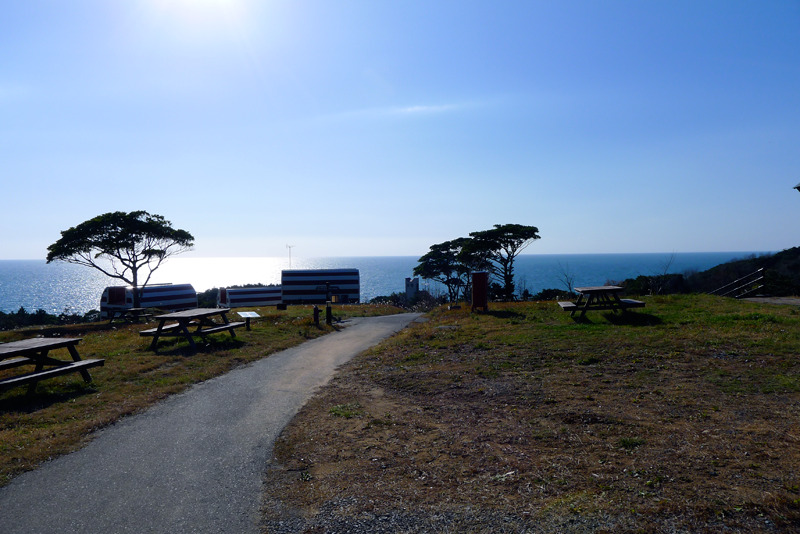 From there, there’s a ferry (or perhaps… there was a ferry?) 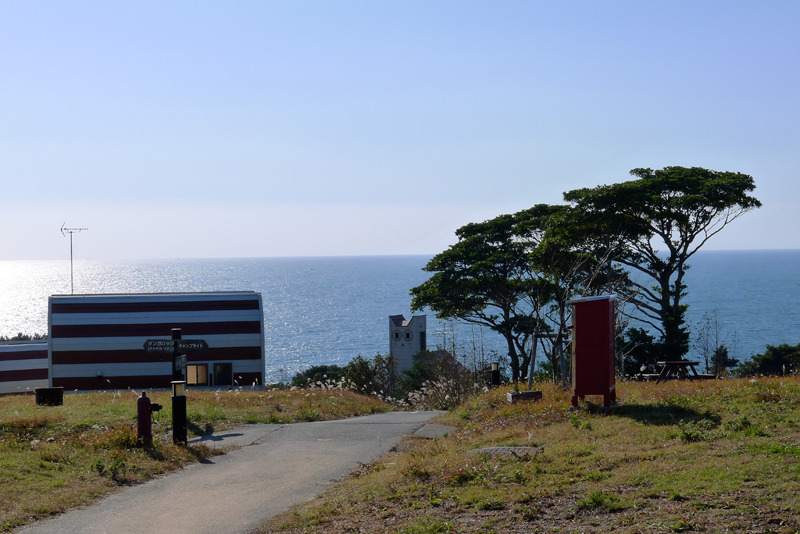 that can take you to Tashirojima. We took a cab from the train station to the harbor with the ferry. If you like cats, then yeah, it’s awesome. 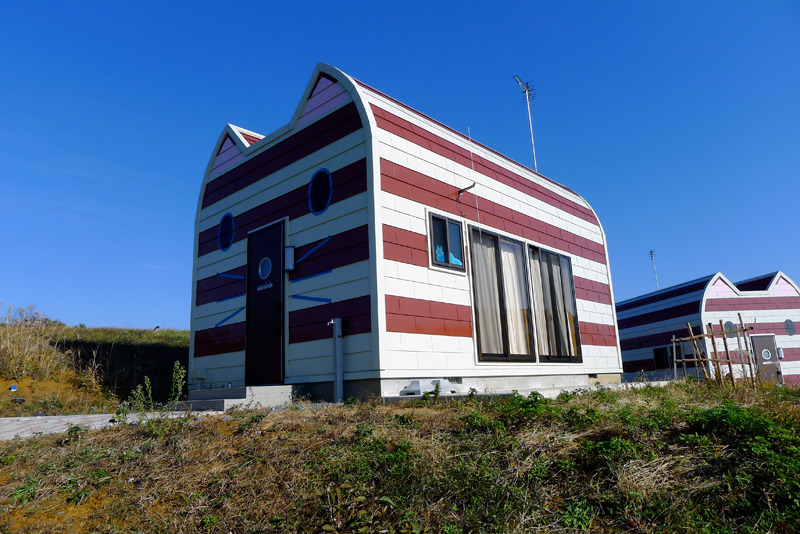 It’s a bit out of the way, and definitely would be considered “rural.” There are places to stay, but the main one (the one with cat shaped buildings) is closed part of the year (for winter). 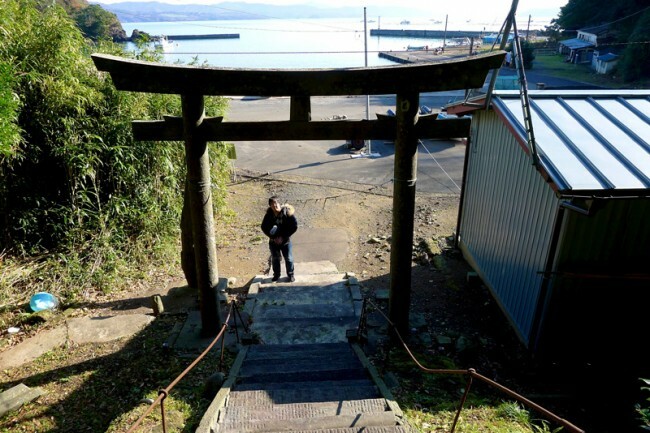 You can definitely make this a day trip (it’s pretty easy to walk across the island in a couple hours, even if you look at things along the way). 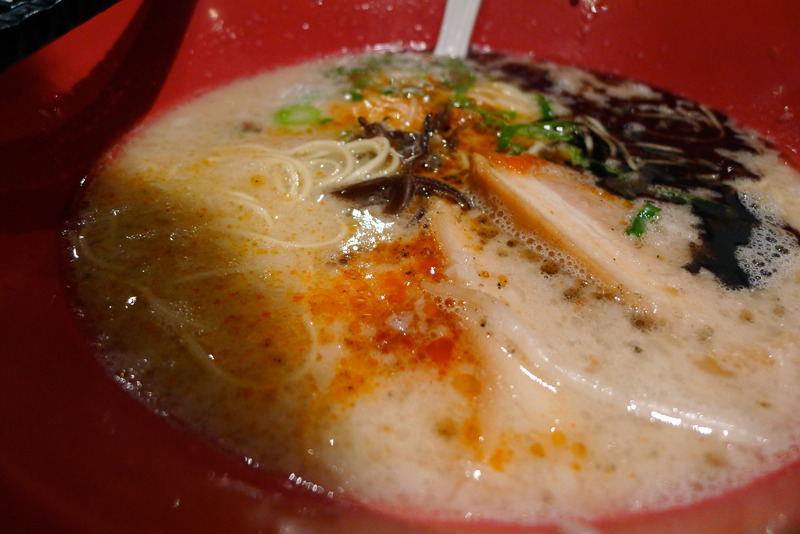 There isn’t much in the way of places to eat, though depending on when you’re there you might be able to find something. Still, I’d recommend bringing lunch / dinner just in case. Also, bring cat food / treats! It’ll make the cats love you, I’m sure. These are some pictures that were taken during our visit to Cat Island, along with some explanation. A little travelogue, if you will. Take me by the paw. Let me guide you to Cat Island. 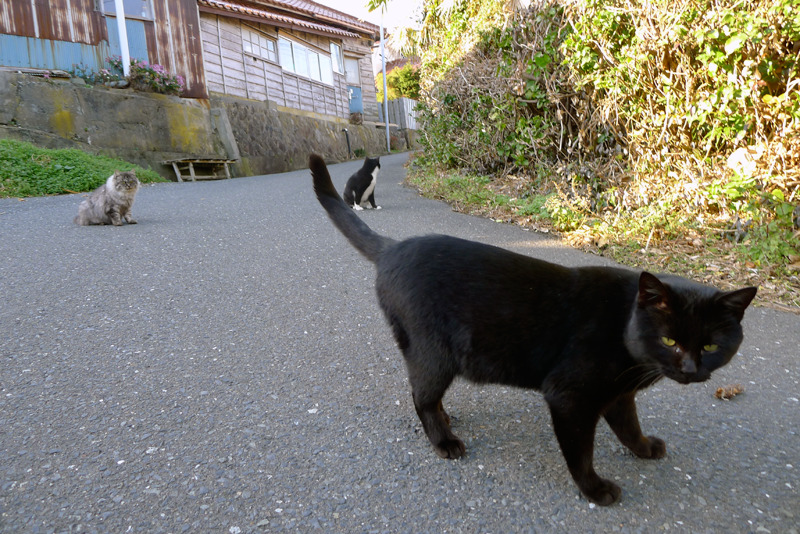 They were having a good time so we didn’t want to bother them for too long and we headed down the road into town to find more cats. 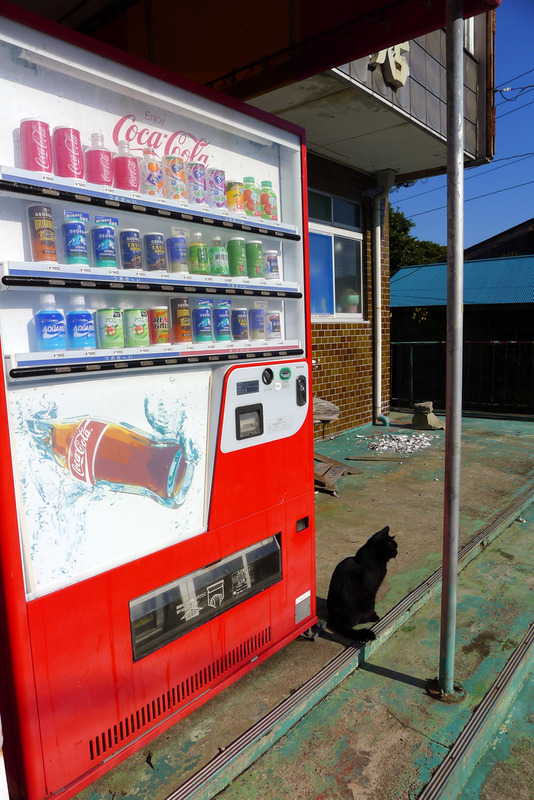 We ran into a store where the other cat-tourist was hanging out, also taking pictures. 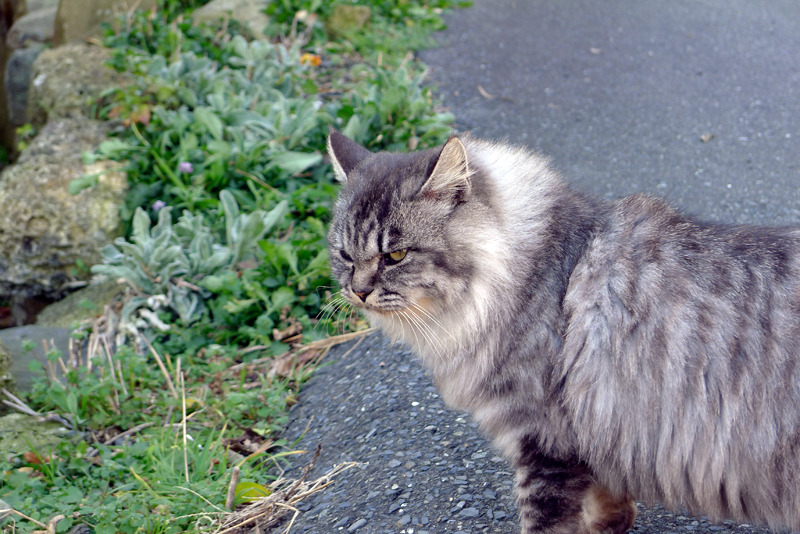 He was more friendly than the other two cat-tourists and talked with us for a while. 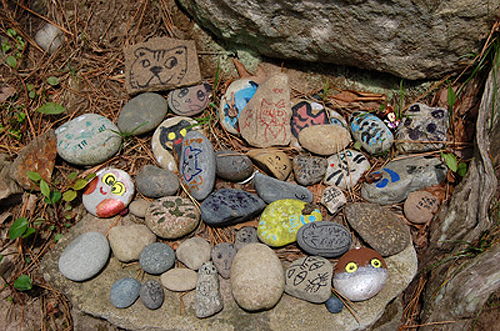 There were a lot of fun cats around here, including these ones. 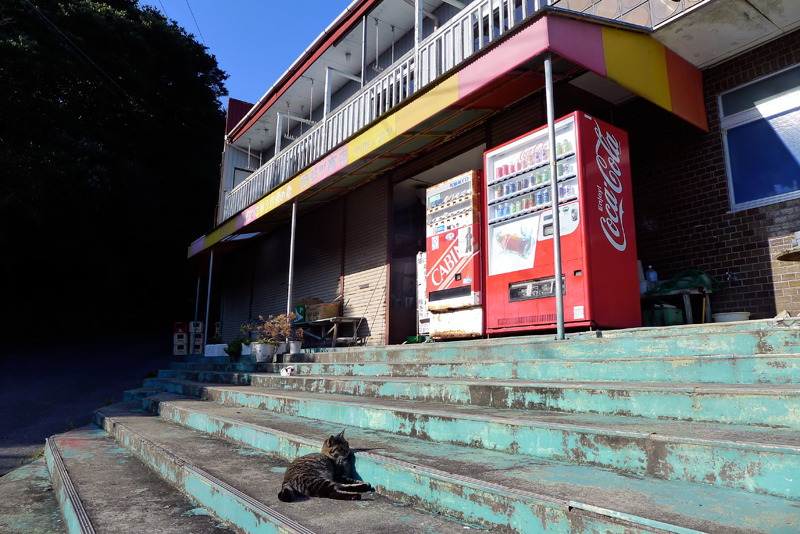 Shinnosuke Instagrammed a shot of the store we just left, then we headed down the road. 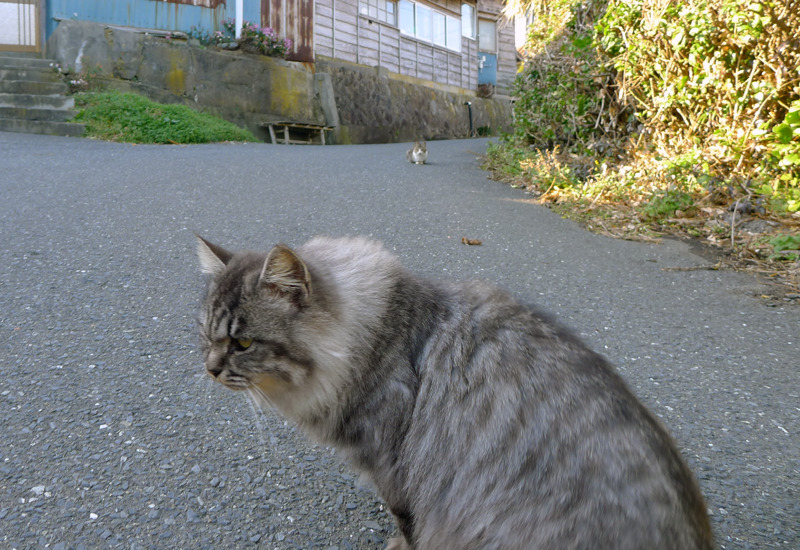 Then we headed down the street where we, of course, came across more cats. 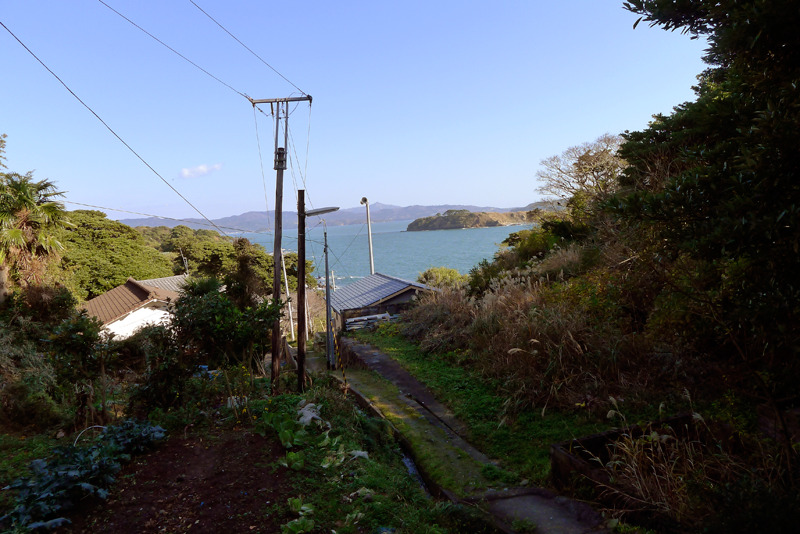 From here we made our way to the ocean, where we saw a sign to Manga Island. We made our way down the hill we had to climb to get here. It was time to go figure out where the ferry would be picking us up, just so we’d know where to go. If we missed the ferry, we’d be stuck here overnight (not a terrible thing, but lodging was sparse). 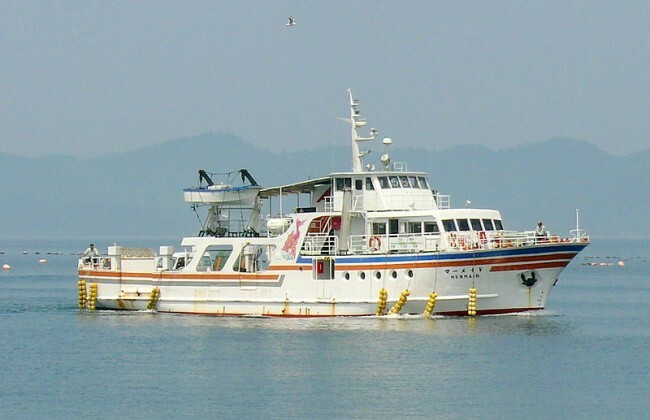 The ferry was only coming to the island twice per day. Once in the morning and once in the afternoon. The dock was pretty neat. 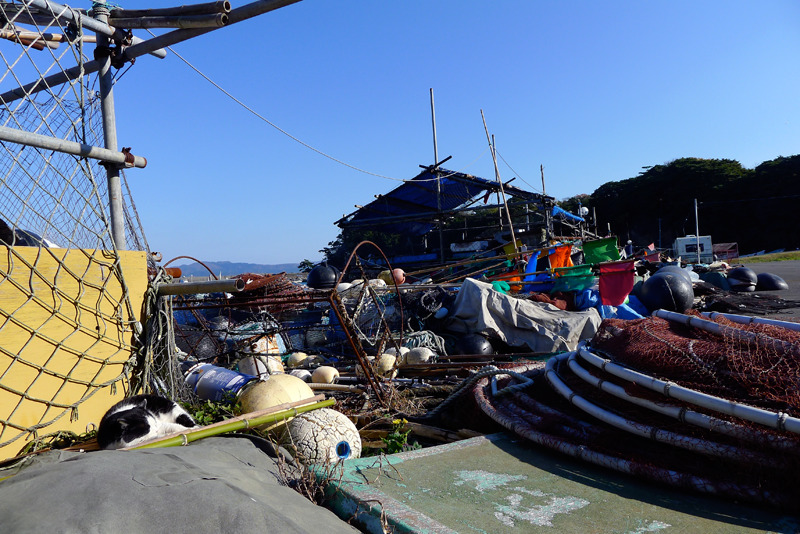 Unfortunately I heard this is the area that got destroyed by the tsunami, really messing up their fishing industry :( There’s a fund drive going to help them rebuild (and to help feed cats). 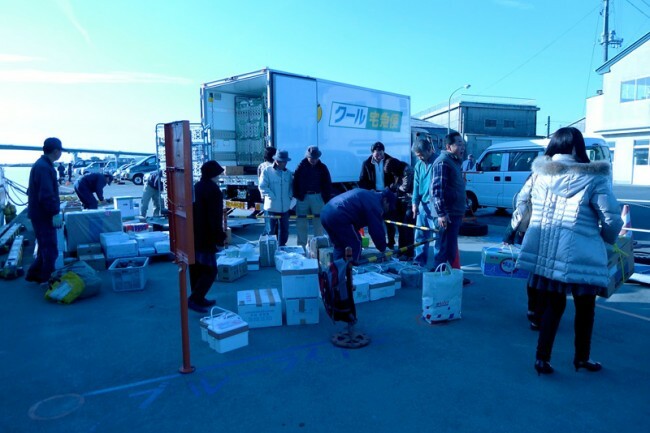 To donate, you will have to call the organizer (and probably need to be able to speak Japanese). The phone number is 080-2810-2914, if you wanted to help. More info on the help-project here. 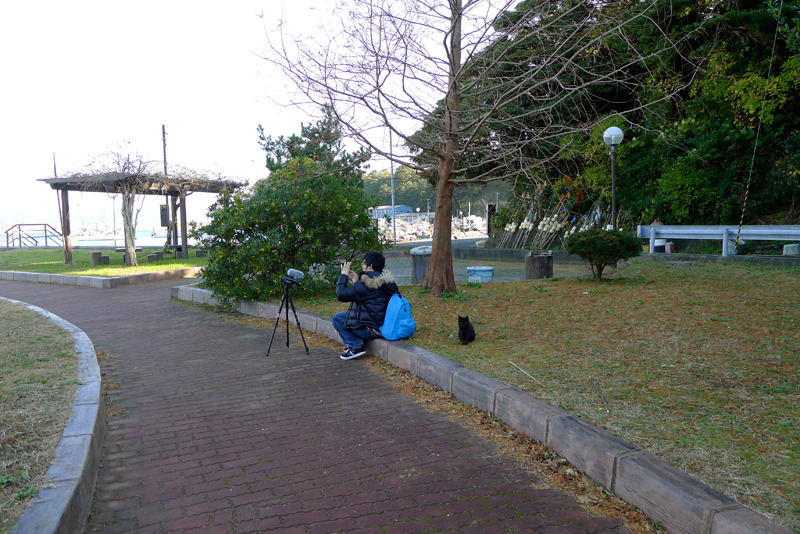 We hung out in the nearby park for a little bit, trying to figure out what to do from here. Watch out, cat! We decided to get something to eat (we were pretty hungry at this point) so we went back up to the store. Good chance to hang out with some cats and get some food, too. 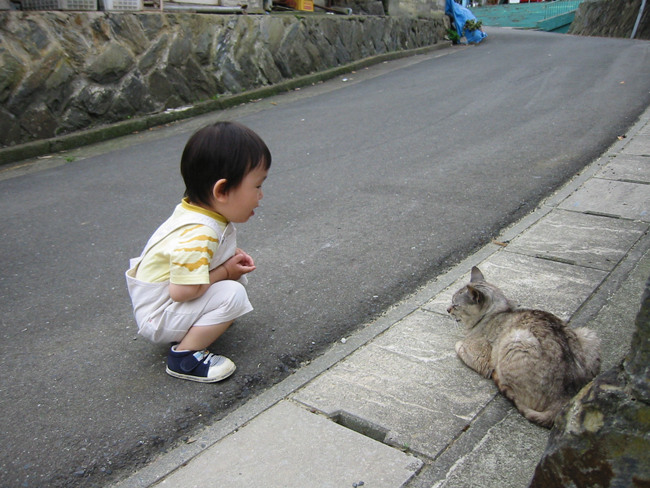 Shinnosuke was a fan of cats. Here’s the store front, in case you wanted to go. Fed the cats some cat food. 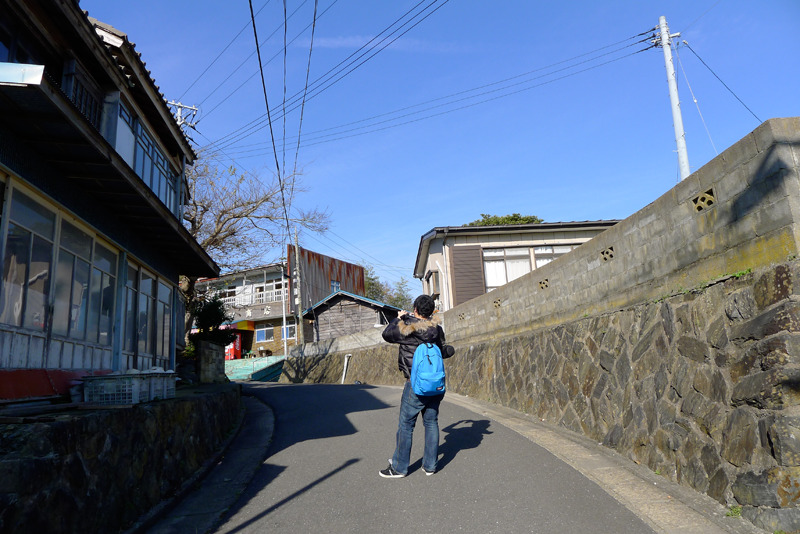 Shinnosuke’s in the background filming. 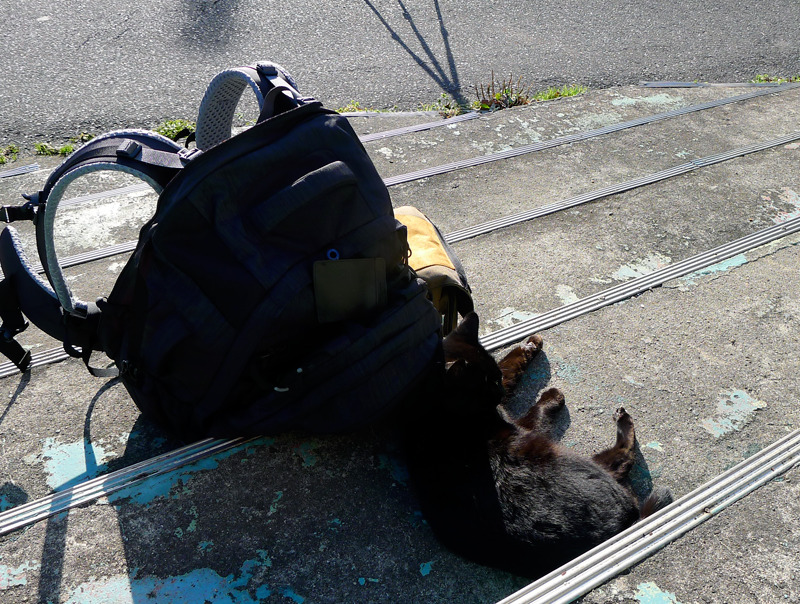 This cat thinks my backpack is comfortable… or at least the shade is cooling. 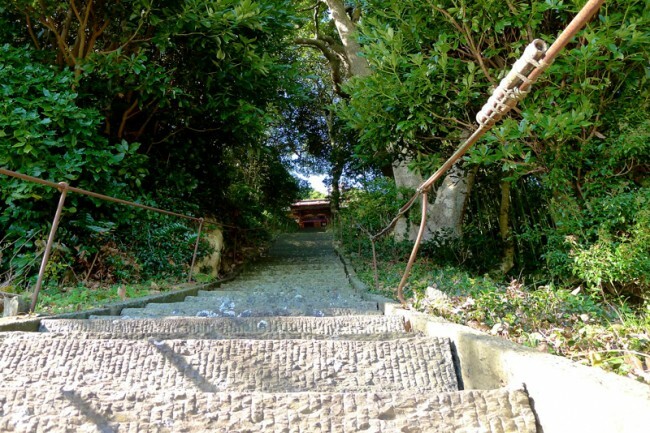 I love this green color on the stairs. Reminds me of old copper things. Kind of nostalgic. 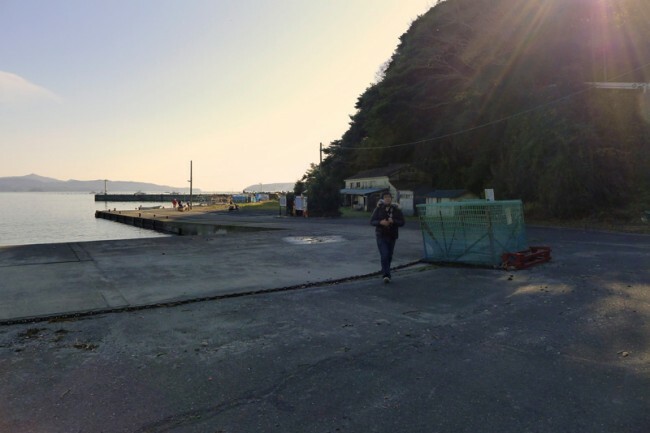 We finished our food and started making our way over to the dock where the ferry would come. Guess what!? 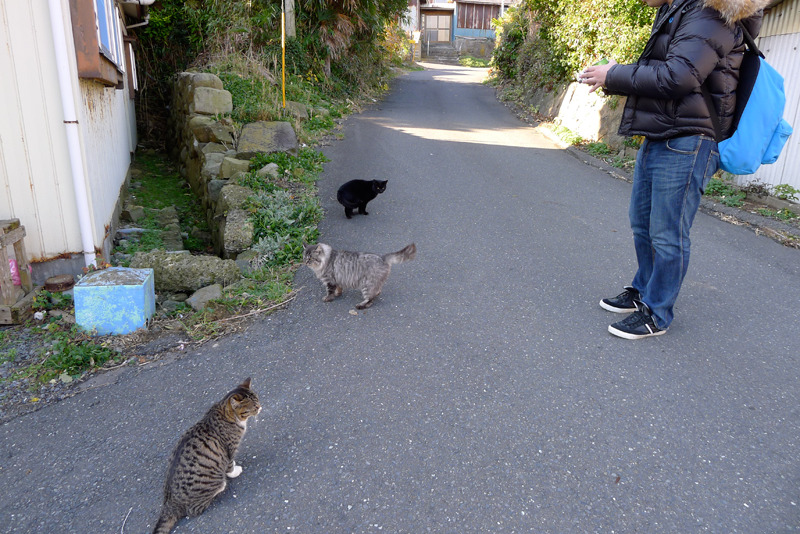 We ran into more cats. Even got to see my favorite cat again! 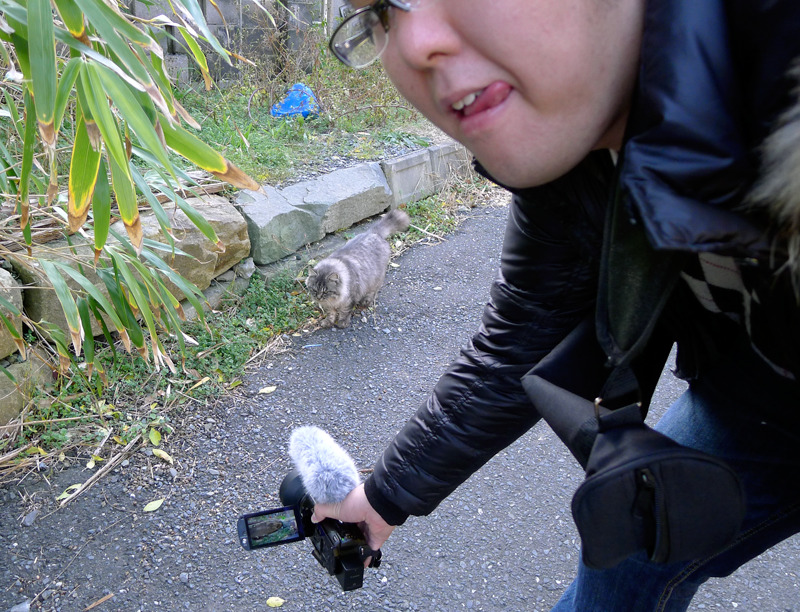 Shinnosuke’s showing us his famous no-look camera technique. 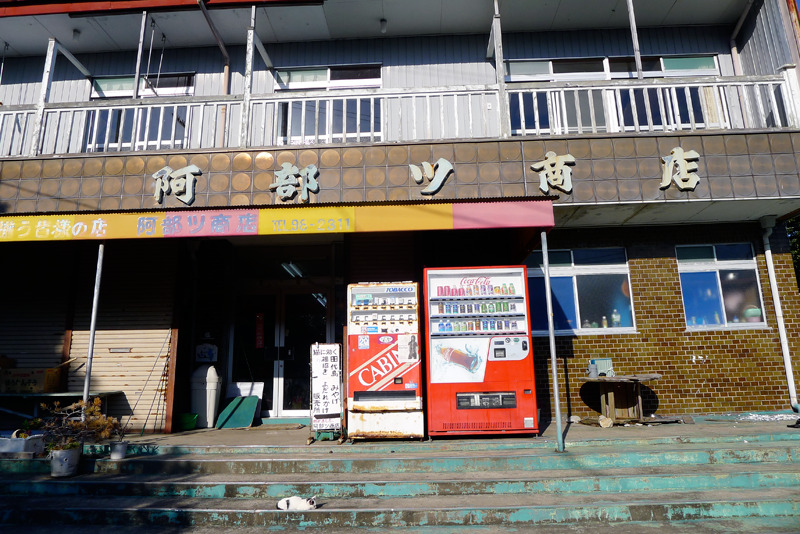 We headed back to Ishinomaki via the ferry, then made our way back to Tokyo area, stopping to get some Ramen along the way. Oh man, it was tasty. The cat side of things was a lot of fun, but I felt a bit sorry for the many old people living in a small island town with shrinking population. 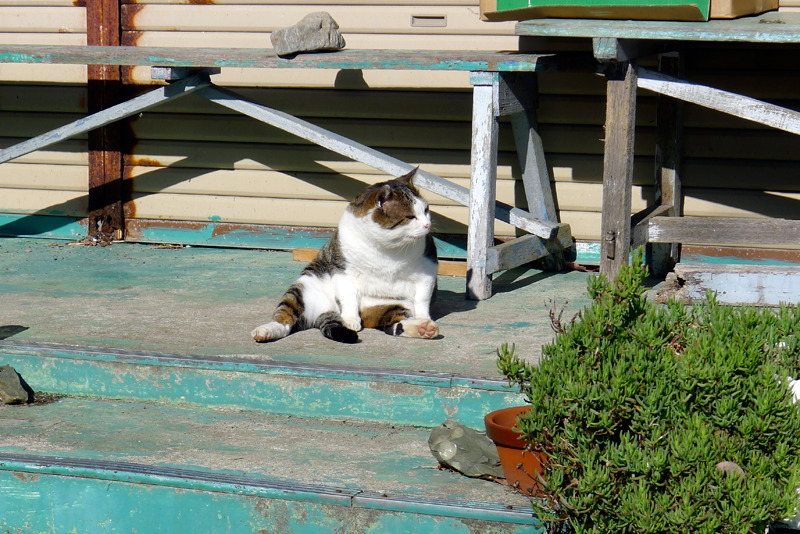 Maybe the whole cats-bring-people-to-revitalize-the-island thing is working, but only a little bit. Definitely a lot more tourists come through in the Summer, but I thought winter was nice too. It’s a lot easier to take pictures of cats when you don’t have other people around. I’d say there were only 3 or 4 other people who came to the island with us. It was nice and peaceful. 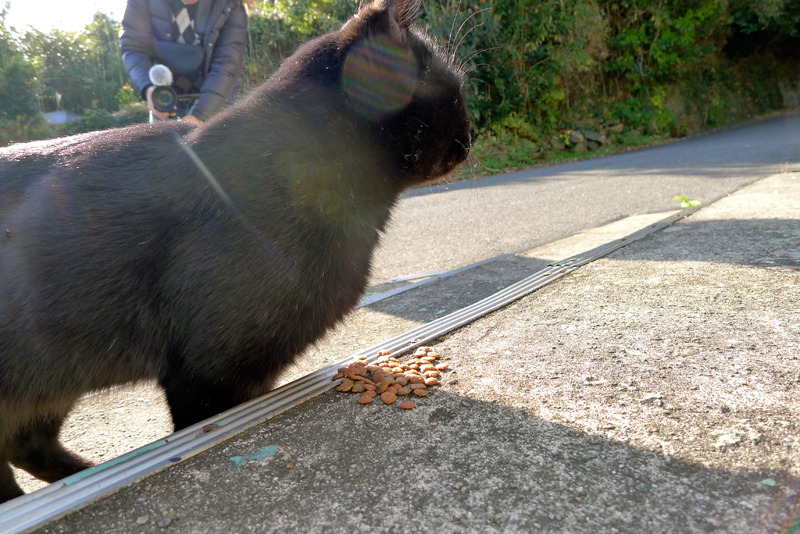 Of course, there were plenty of cats, though we didn’t make it in time to see "the feeding" which is apparently an old lady who just feeds the cats (and then they zergling rush her position). We made it through and around the island pretty easily in one day. 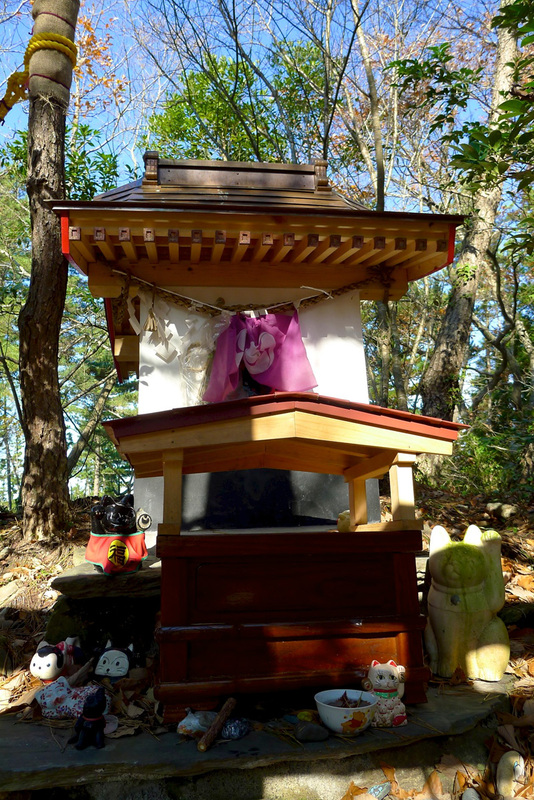 It’s not all that big, and we were able to hit the big land marks, like a couple temples, the Cat Shrine (Neko Jinja). 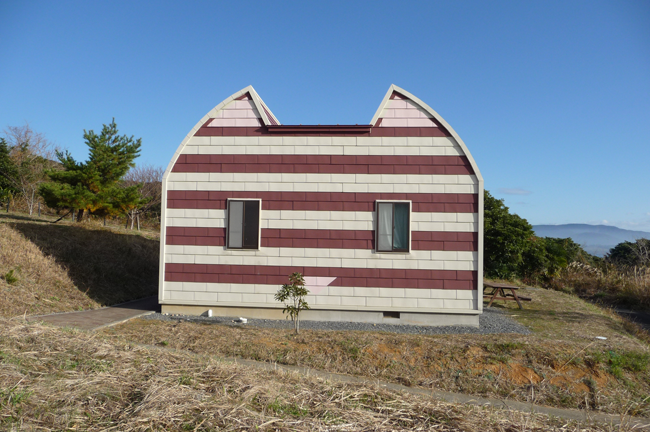 And the cat-shaped houses, which you can stay in, as long as it’s not Winter (they close, because very few people come to Tashirojima in the winter). And of course, all the cats. 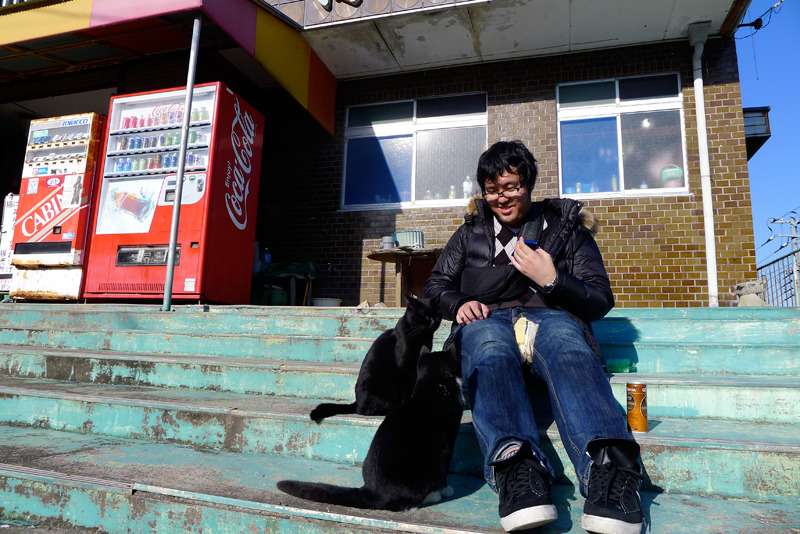 Cat Island Tashirojima was a lot of fun. Definitely peaceful and a nice atmosphere. If you’re into cats, then it’s the kind of place you’ll almost certainly enjoy. It takes a bit to get out there, but if you time things right you can spend the night and enjoy the island for a bit longer. I’m not sure why I’m giving this place such a high rating. Maybe it’s just because of how unique this place is. 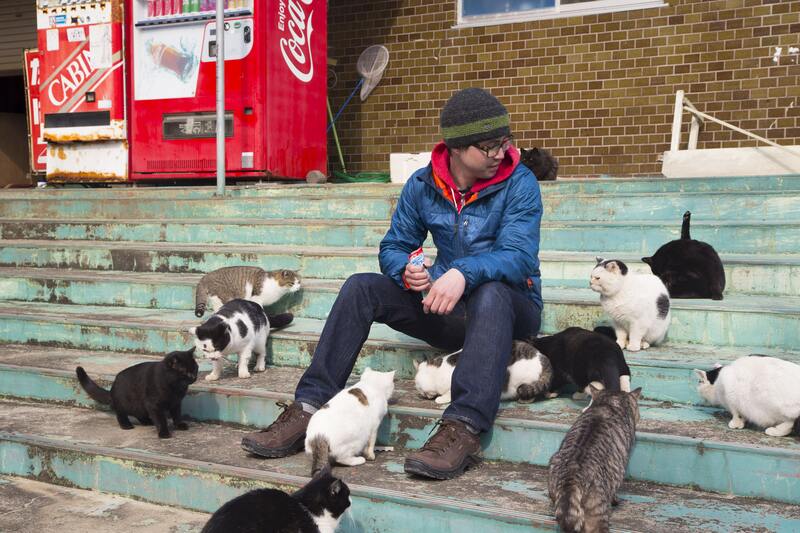 It’s like a museum, but with hundreds of live cats. Everyone is very old, and everyone is a cat lady. There’s something wonderful about that. 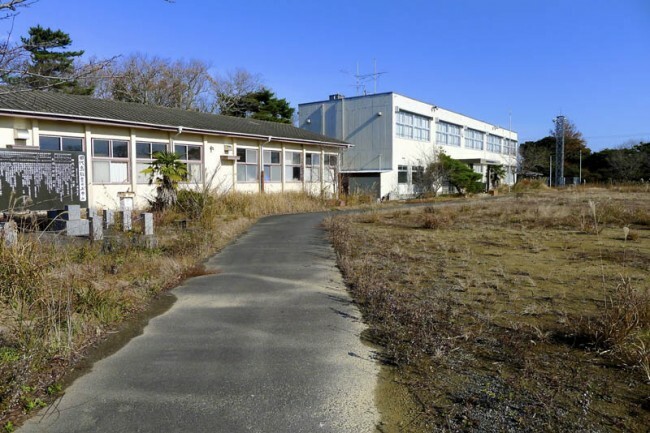 I recommend the abandoned school accommodations. 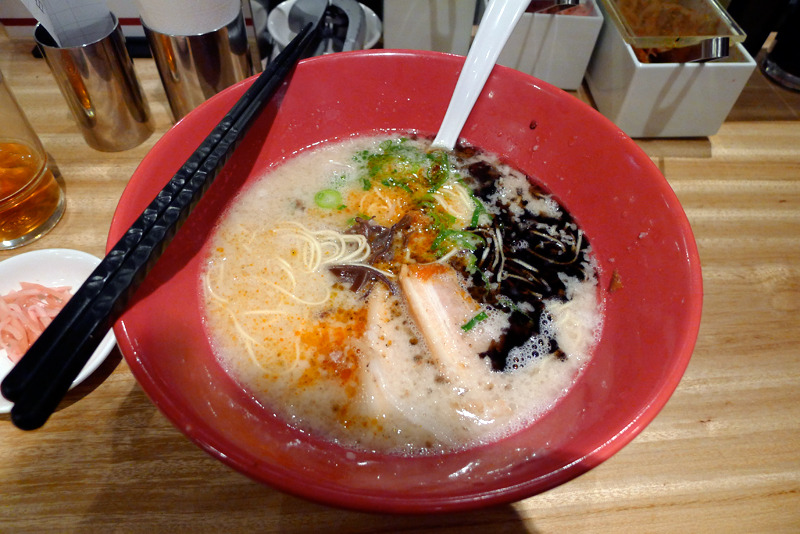 I suggest this as more of a second or third trip to Japan option. 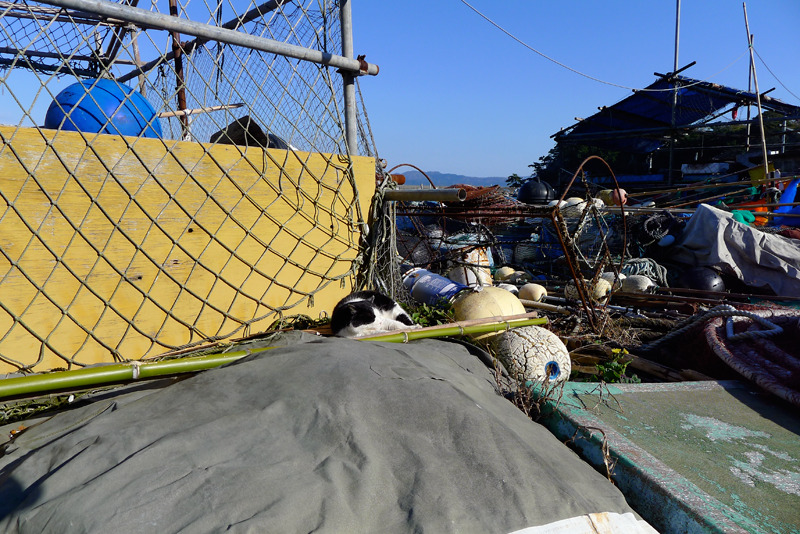 It is interesting to see a small, dying island inhabited by feral cats. Just don’t expect it to be some cute, majestic cat island. Cats, cats, and more cats! 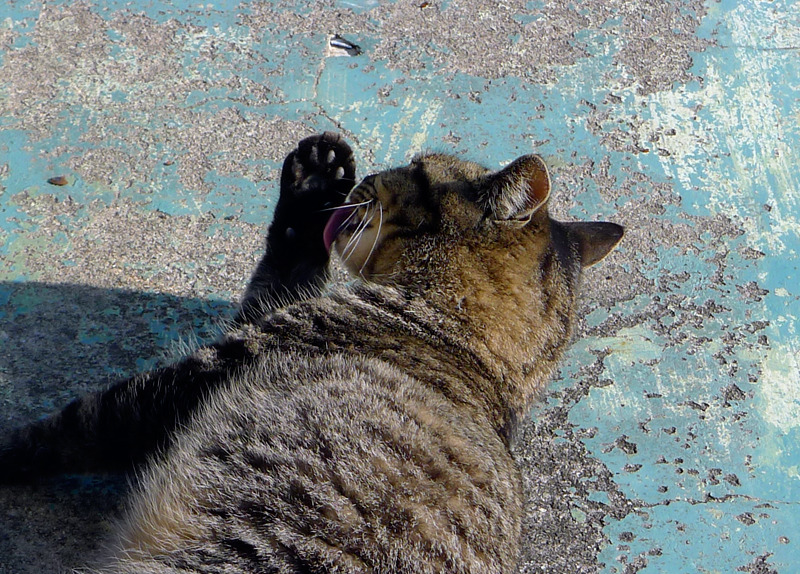 Cats are pretty feral, dirty, and sometimes mean, especially if you have food or they sense weakness. Fairly secluded and difficult to get to. 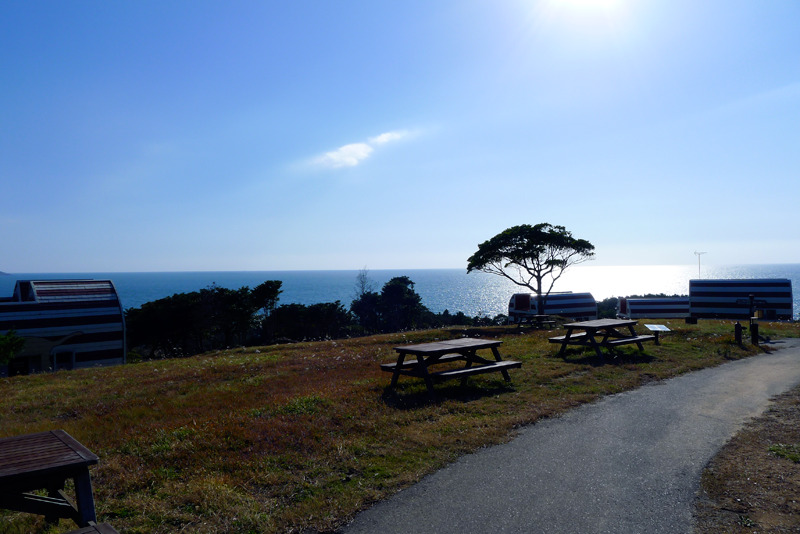 Much of the island is closed during the non-summer season.